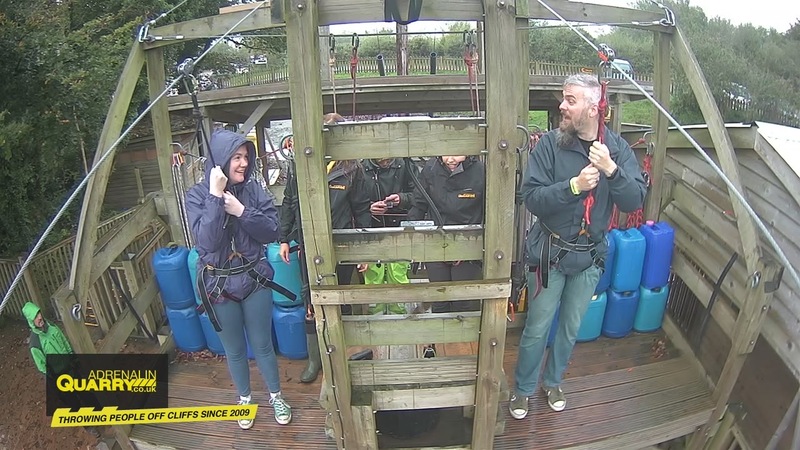 Apparently the youngest person to complete the zip wire was only 14 months old ,we found out after we’d finished – pretty crazy! By the time we’d walked back up to the platform (the original plan was to have the gig on the jetty at the bottom, but the drizzle put paid to that so we relocated to the balcony. 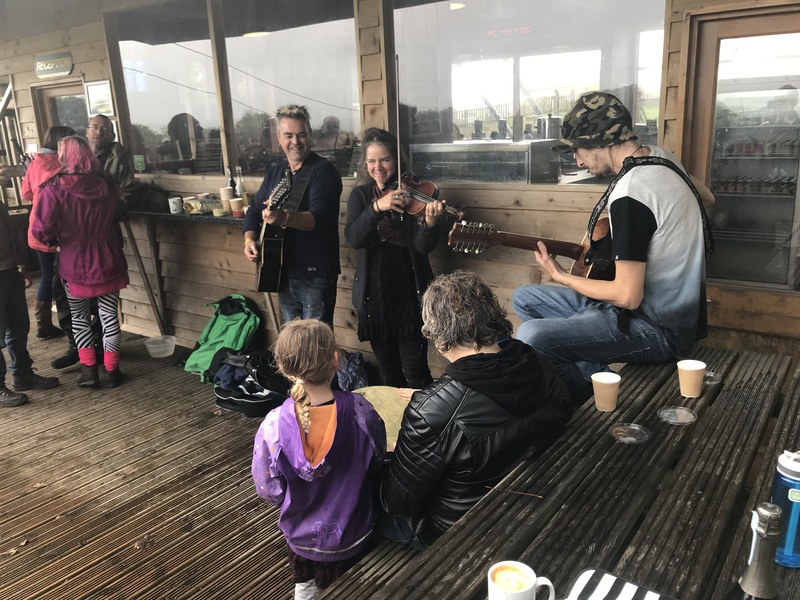 Tim and Athene had provided some nibbles and sparkly wine, so we had a graze whilst listening to some lovely acoustic tunes – A Thousand Years, Year of the Clown, Drink with God and Look to the Stars were the songs of choice – it was a lovely moment to witness. Jamie played a 12 string guitar much as Tim does as obviously an electric bass doesn’t fare too well in an unamplified setting, and unbeknown to us at the time we witnessed Rich’s first ever public performance on a guitar for Look to the Stars whilst Tim and Jamie were providing the mesmerising whistly bits. Combined with Arlo and Eliana providing some excellent accompaniment on Rich’s djembe (I have a serious hankering for a djembe now!) it was just a delightfully and intimate experience that I’ll cherish. You can see the video that Nial put together of the day too here. 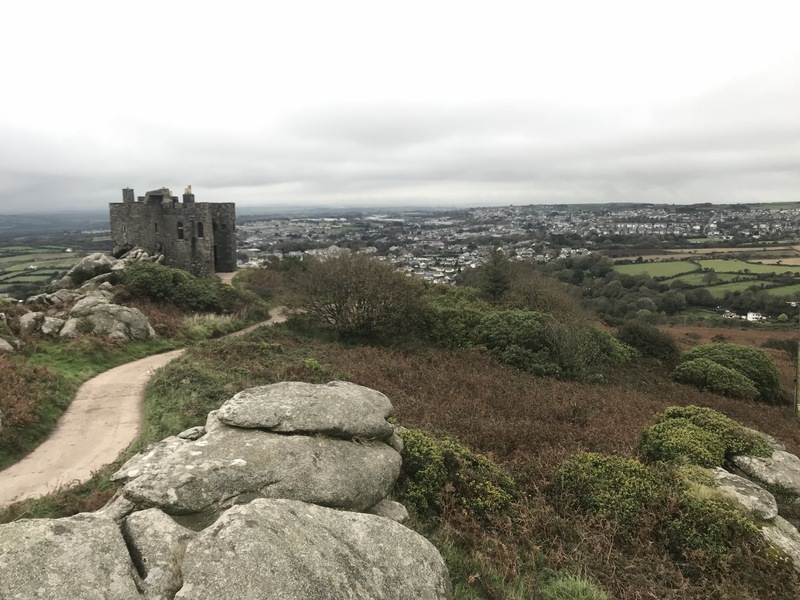 But that wasn’t all – we continued our drive further into Cornwall to check in to a frankly gorgeous B&B in Saint Day on the edge of Redruth in Cornwall. Taking the lovely lady who ran the place’s recommendation we popped to the nearby Star Inn for some food – as it turns out this is the very pub in which Tim had his ‘drink with God’ from the album track. After breakfast the next day we had the day to kill, so spent a lovely few hours in St Ives – one of my favourite places – before wending our way back to a desolate looking hill with Carn Brea castle perched precariously on it. We were dead early – we drove right up to the castle but decided after an explore the drive down the track at night would be scary so repositioned the car further down next to Jules and Tom’s converted ambulance. 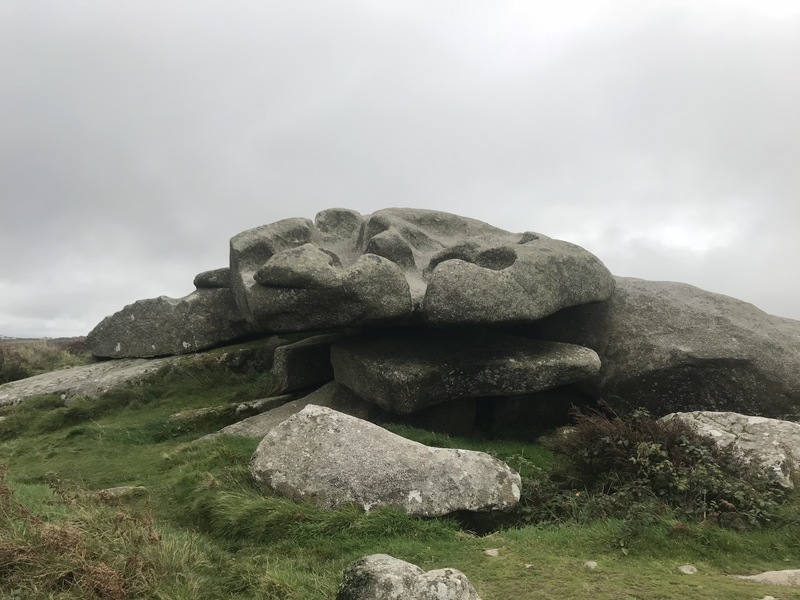 The hillside was strewn with mysterious rocks – many of which legend would have it are assorted body parts and even the furniture of a local giant (John of Gaunt, purportedly the last of the giants of Cornwall). I hope it wasn’t disrespectful to have clambered about on his face whilst exploring – sorry, John! 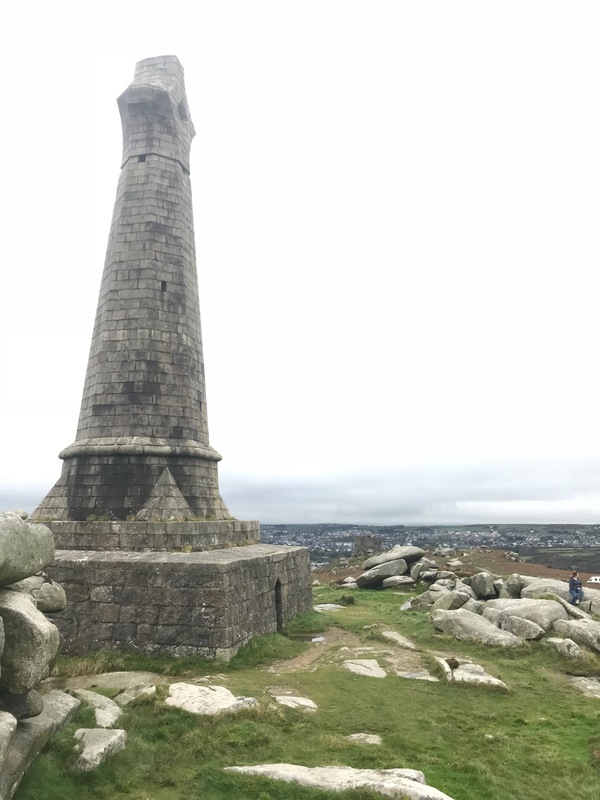 Looming above the castle and rocks is the 90 foot tall granite monument – erected to honour Francis Bassett, a local philanthropist – a member of a notable mining family in the area known for looking after his workers in an industry where that’s often not the case. It’s an imposing structure – with a barred gate in the base offering an intriguing possibility of climbing inside it, alas now it appears to be a repository for discard cans and other detritus left by inconsiderate visitors – such a pity to see sites treated with such disrespect by other wanderers – but awe inspiring nonetheless! By the time we’d finished our explorations and had a quick drink in the aforementioned awesome ambulance with Jules and Tom (who were not-so-stealth camping for the evening) it was time for us to head up to the castle where a gig and a Lebanese vegetarian banquet was on offer. 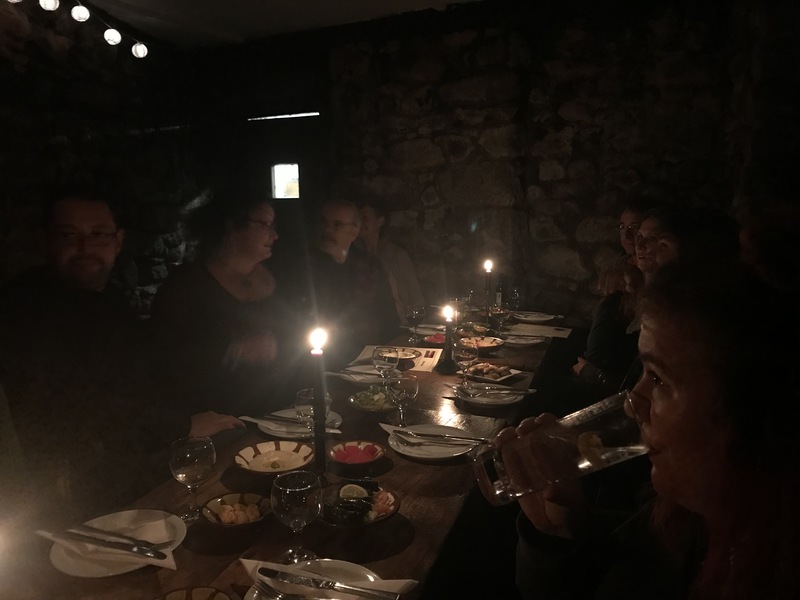 It was already getting dark – so it was pretty atmospheric walking into the door to be faced with a crackling fire and laughter from the already assembled folk upstairs. When I bid for it I imagined a spacious feasting hall, but instead winding stairs and small nooks were on offer – but beautiful by candlelight, and it turns out we ended up in amazing seats to catch the music! 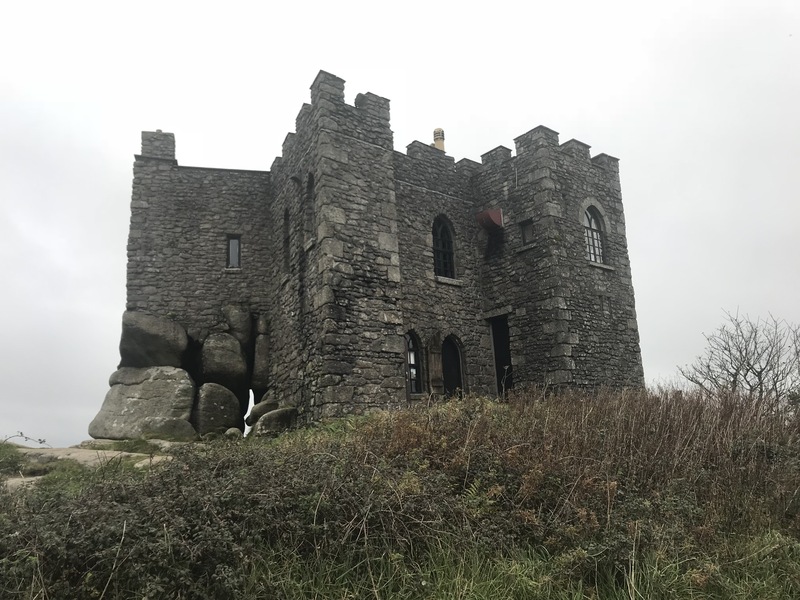 Carn Brea castle operates as a restaurant normally – and what an amazing space. We had an explore over the 3 floors before checking out the roof space too, taking in the last of the spectacular views as the mist set around us and the darkness continued to fall. It was great to catch up with some of our zip wire friends as well as meet the rest of the group – I find it a bit daunting to meet people I’ve admired performing, but Tim, Athene, Rich and Jamie are all so lovely you can’t help but feel at ease – and the other pledgers, friends, family and crew were awesome too. Once exploring had finished we settled at a table and soon enough the first course of tasty treats was served to the table along with drinks – the food was awesome, any feast including halloumi is always going to win with me – there was interesting tidbits too like pickled turnip, stuffed vineleaves, houmous and pitta bread – it was a surprisingly filling course! Meanwhile Tim, with help from Arlo, was busy getting guests to pick either a song or a prize from a hat. I picked out I Love You much to the amusement of the assembled folk. Meanwhile Ella won a bottle of whisky! 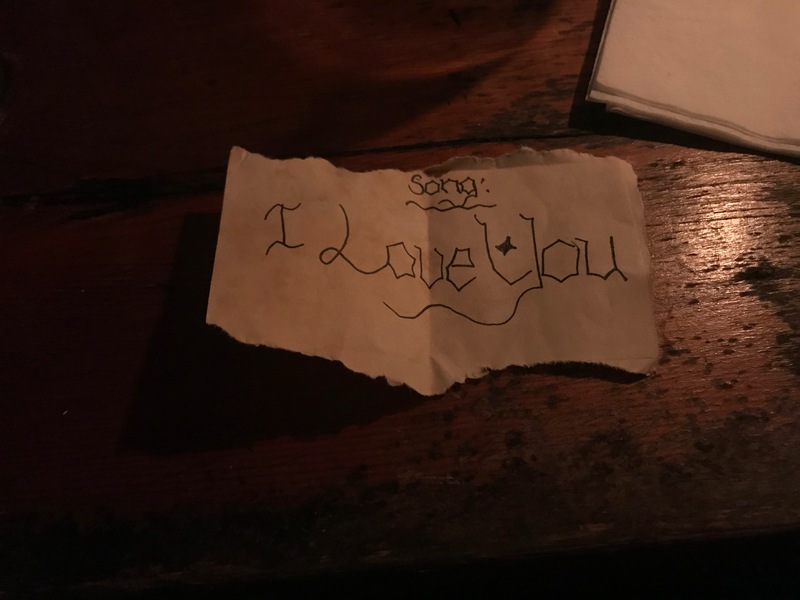 So after each course we’d be treated to four songs from the album – the first batch of these were Delighted to be Invited, A Thousand Years, I Love You (which was simultaneously hilarious and cringey when sung directly at me – haha! ), and then the excellent We Are Revolution – Arlo was lured from blowing out candles in order to contribute some awesome backing vocals. The candlelit setting was brilliant for atmosphere – less so for photos and videos, but well, photos are only there as aids to memories – and these will linger long! Jamie had got his bass amped up gently, but Tim, Athene and Rich were properly unplugged – and sounding great. 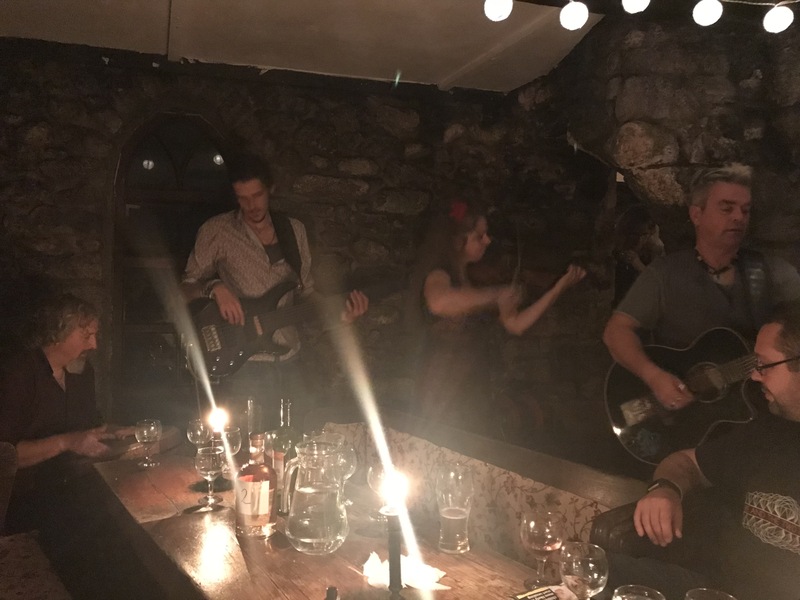 The acoustics in the enclosed and stone-clad space were great, and happily for us their playing space was pretty much surrounding us. It was magical. The first set of songs was done and it was time for the main course, more lovely food, more drinks and amusing chatter and it was soon time for more music that had been picked out of the hat. 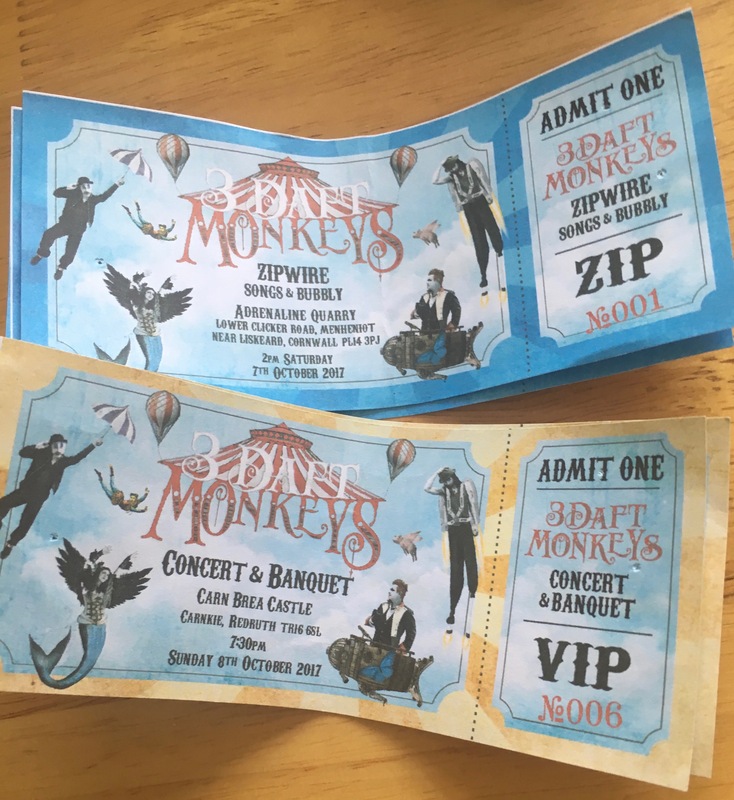 Ella had had a bonus pick as this was her birthday present and snagged two tickets to a 3 Daft Monkeys gig of her choice – result! The next songs out the hat were Dream of Angels, Animal, Not in my Name and Year of the Clown – all of them sounding fantastic. I was keeping a careful eye on Rich in particular as I love the range of percussive sounds you can get out of a djembe – I’ve looked since and they’re not cheap though, so one to ponder some more! After those songs there was a bit of Monkey Karaoke which had been pulled out the hat – we were treated to a really good rendition of I Love You again with 3 Daft Monkeys playing backing band, a fun moment! We’d been interspersing courses of meal and music with trips up to the roof to have a crafty vape (or a smoke for those of that inclination) – upon heading back down some really tasty baklavas were waiting for us, and then it was time for the final run of songs – Drink with God was up first, taking on extra resonance since we’d been in God’s local the night before, Money was next and then Blessings for a first ever live airing. Probably the highlight of the set for me was the moving Look to the Stars though, about a refugee who was swimming between Turkey and Greece and somehow survived. The whistles from Tim, Athene and Jamie with Rich on guitar are just, well, wow. I don’t think the video does it justice – but I’m happy to have captured it regardless! With time marching on last orders were called, but were were treated to a couple of bonus tracks – and pleasingly for me amongst my favourites – Days of the Dance did seem a bit strange without the ability to have a waltz, and The Antiquated and the Arcane is one of my absolute favourite songs – full stop – not just by 3 Daft Monkeys. Wonderful. All in all, a really memorable experience – it was great to get to know the band, the other pledgers, their family and friends – it was everything it promised to be and more, and was a small part in helping the awesome album Year of the Clown get made too – everyone truly was a winner this weekend!